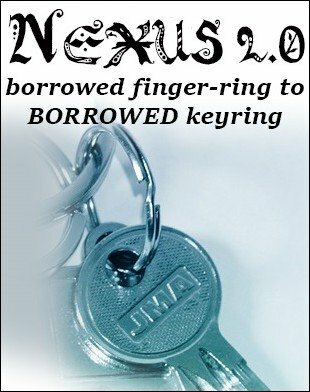 Borrow a ring and a set of keys and visually link the ring onto the keyring with a tap. Impromptu and clean, nothing to find. The ring is seen to go right through the keyring with only a tap, highly visual and undeniable, then you let go of the ring and let it hang from the keyring clearly and unmistakably. After they confirm that that is their ring hanging from the keyring, you melt the ring back off the keyring where you tapped it, and hand everything back, completely clean. 1st edition 2016, length 7 minutes.